Ooooh I likey very much! Lulu is releasing some gorgeous tanks these last couple of days, no? This is the Feather Print Cool Racerback Tank I mentioned in yesterdays post. Sadly it has a slight sheen to it which means it’s probably polyester but I’m holding out hope that it isn’t. Luckily there is also supposed to be a Modern Racer Tank in this print as well according to an educator so I wont feel to badly if I have to pass on this one. I’m intrigued by the Heathered Pigeon Pearl Luxtreme as well since it’s supposed to be pearlized and have a slight shimmer. This one is probably top on my list as far as practicality for running goes. 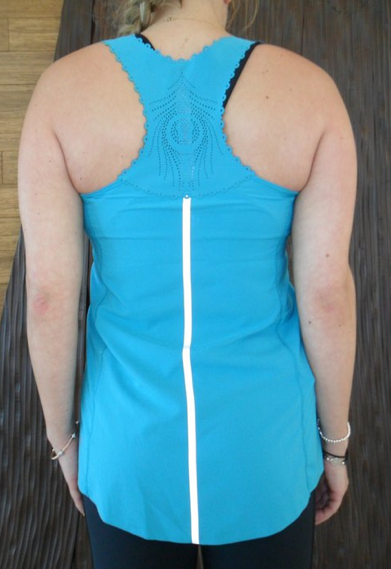 It’s pretty and so perfect with the flowy design, strip of reflectivity and weightless fabric. I missed out on the Hip Halter Tank last year for some lame reason. I think it was only because I couldn’t pick a color I liked (Pig Pink vs Wish) so I missed out altogheter. The back strap around the neck was a bit snug so this is a really nice solution for those of you that get neck pain with designs like that. Plus, it’s a pretty detail. "Monday Product Drop Store Report"